— Off to the side, the ogres fill the goblins in on what had happened to them. Apparently, orcs are supposed to be much, much weaker. Supposed to be, anyways. But obviously, someone is helping the orcs out. 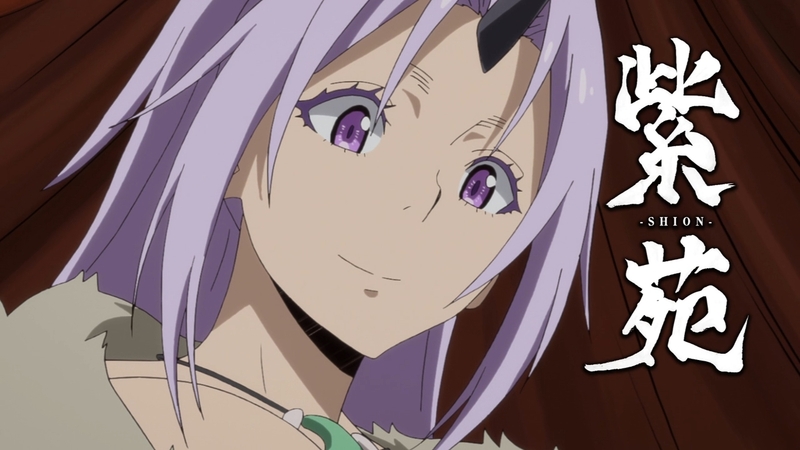 — Remember when the lead ogre guy wanted to kill Rimuru because of his mask? 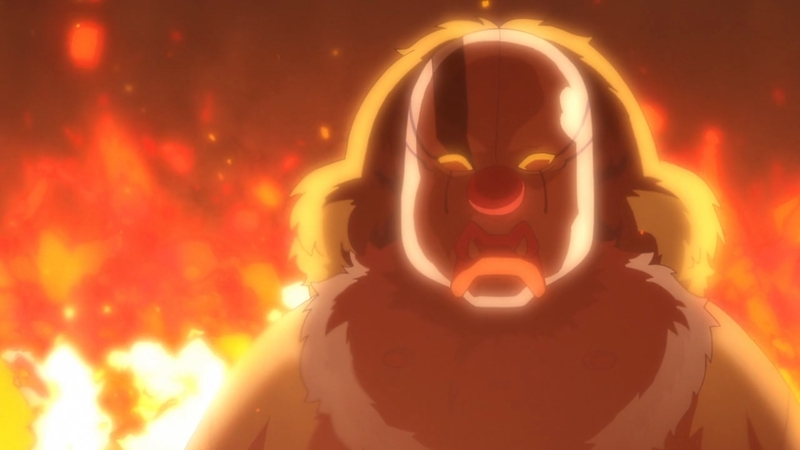 That’s because the bad guy also wore a mask — a mask which looks nothing like the one in Rimuru’s possession. C’mon, it’s not even close! — The group speculates that the orcs must have sided with a demon lord. 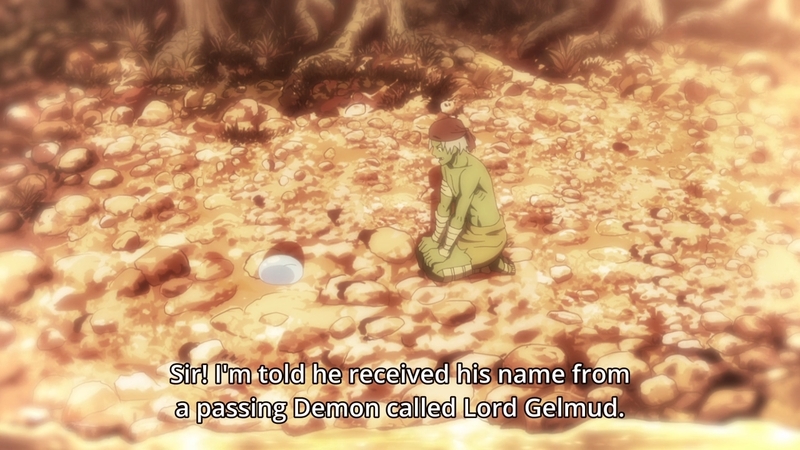 So just exactly how many demon lords do we have in this universe? You get to be a demon lord! 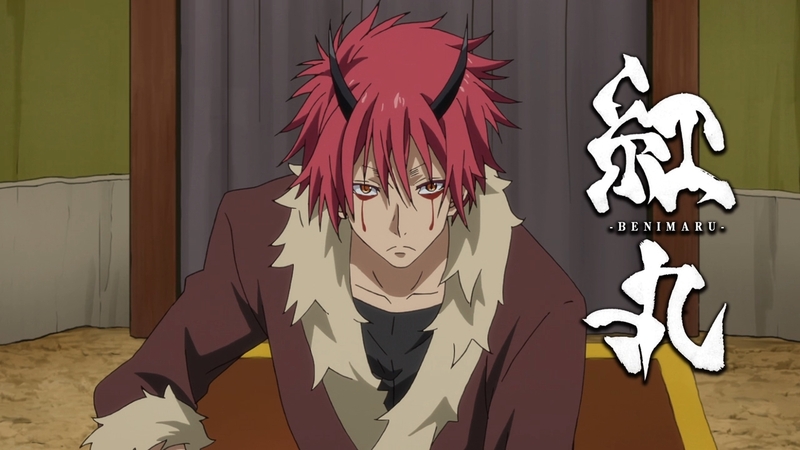 You get to be a demon lord! And you get to be a demon lord! We’re all demon lords! Nobody ever wants to be an angel lord. — The ogres only numbered 300 before this big massacre? I dunno, that seems kinda small for a village. — Needless to say, our hero offers the remaining ogres the opportunity to stick around the goblin village. Even so, the ogre leader needs to think about it. Think about what? There are only six of you left. May well depend on a friendly community for food and shelter. Is he unable to swallow his pride? Plus, I feel like both of the girls should be involved in this totally serious discussion. Too bad they’re busy cooking and dancing. — In the morning, the ogre leader’s compromise is to stay until the orcs are defeated. It sounds like he never even talked about this with his sister. 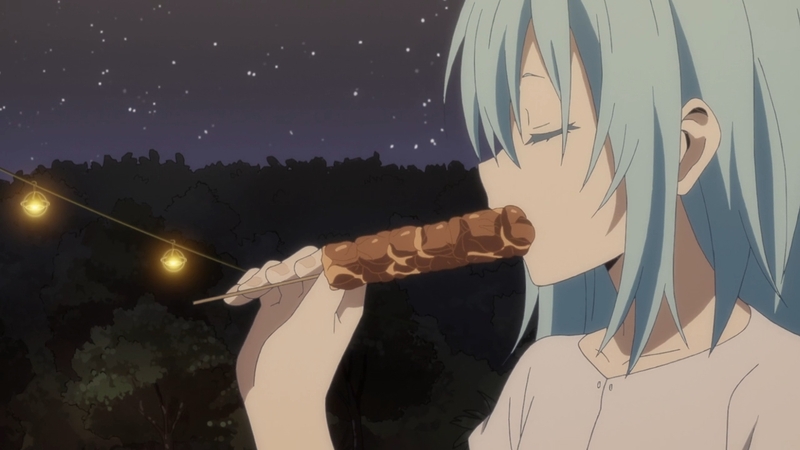 — I don’t see why they have to serve and bow to Rimuru though. It can just be a mutually beneficial pact. Why does one of them have to be the master? Well, we know why. 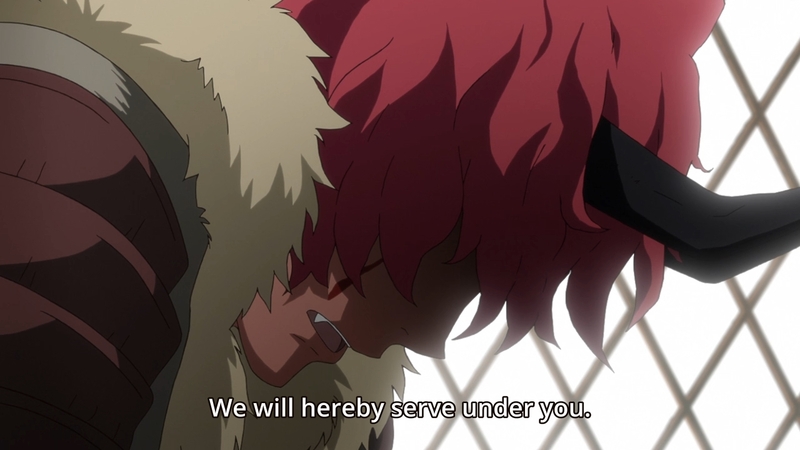 This show is headed towards Rimuru ruling over an empire. Establishing this goblin village is just the first step. Eventually, he’ll become a great lord in his own right. Hell, maybe even a demon lord. It’s the sort of escapism that’s trendy right now. 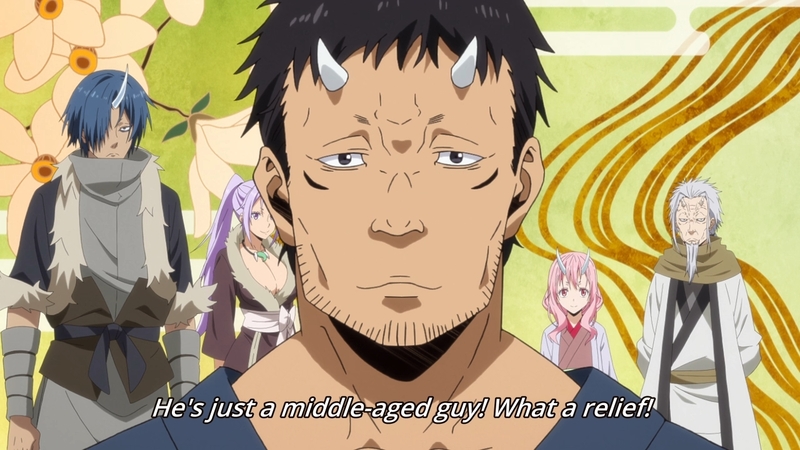 All the nerds out there wish they could just rule over people with an iron fist, but it’s okay, because they’d totally be a sweet and gentle person like Rimuru. 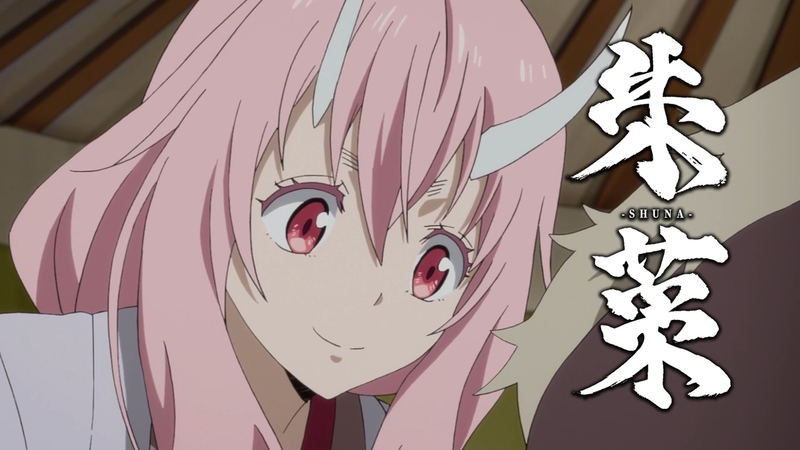 — Anyways, Rimuru proceeds to name the ogres, so they’ll evolve. Again, it’s a strange gameplay mechanic, but whatever. — For a genderless slime, our hero sure is getting a lot of action. — The ogres have evolved in kijin. Okay. The ogre leader actually shrank and looks a bit less… interesting, if I’m gonna be honest. Now he’s even more of a generic anime character. — The same thing happened to everyone else. The princess is now named Shuna, and she looks dull compared to her former self. Last but not least, we have Shion. Okay, obviously she’s not the last, but I’m too lazy to cover the rest of the kijin. 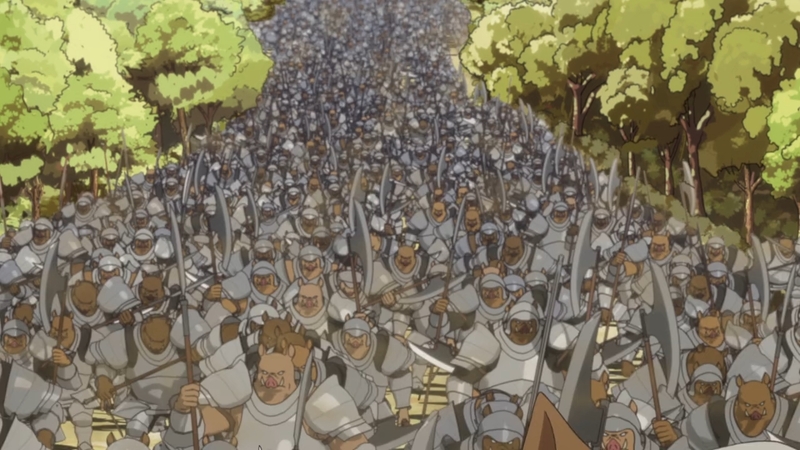 — Elsewhere, we see the 3D orc army on the move, and they apparently number 200,000 strong. That’s a massive army. That’s larger than most modern armies. 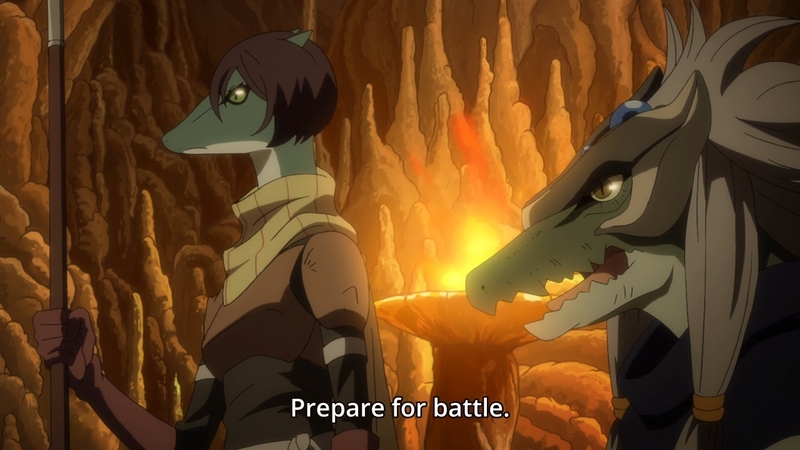 — We also get some exposition about the lizardmen. As long as I don’t have to see these lizards flirt and mate, I’m good. — Dude… lizards with hair. That’s so weird. — I guess the one good thing about this show is that we’ve spent very little time with the human nations. It’s mostly been goblins, ogres, orcs, and other demihumans. This is a nice change of pace. I just wish their designs were a little more beastly and a little less… well, human. 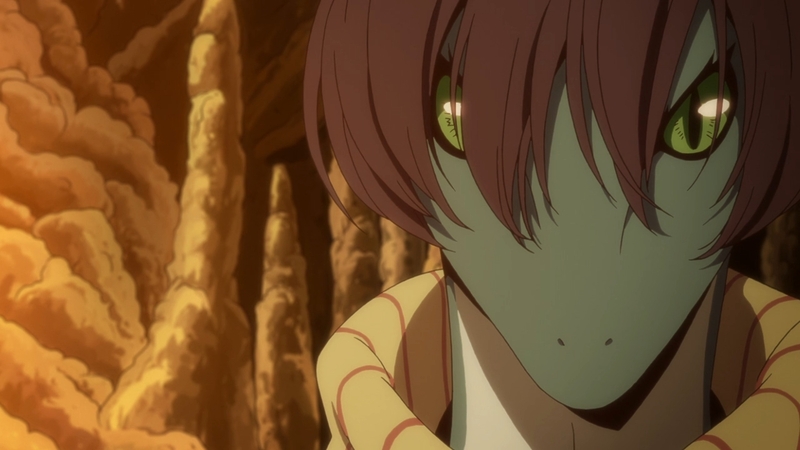 — Oh lord, Gabiru, the lizard hero, is staring at the lizard woman next to his father. Please no lizard mating again. — Talk of the orc lord is popular back at the goblin village too. Something about how this beastman can devour his allies’ fear. Well, that pig we saw two episodes ago must have been turned into this orc lord. 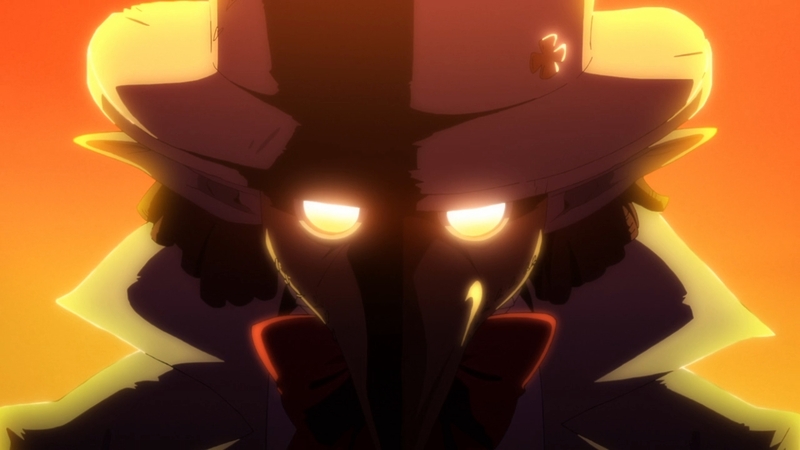 — According to Benimaru, the plague mask guy also offered to name them. 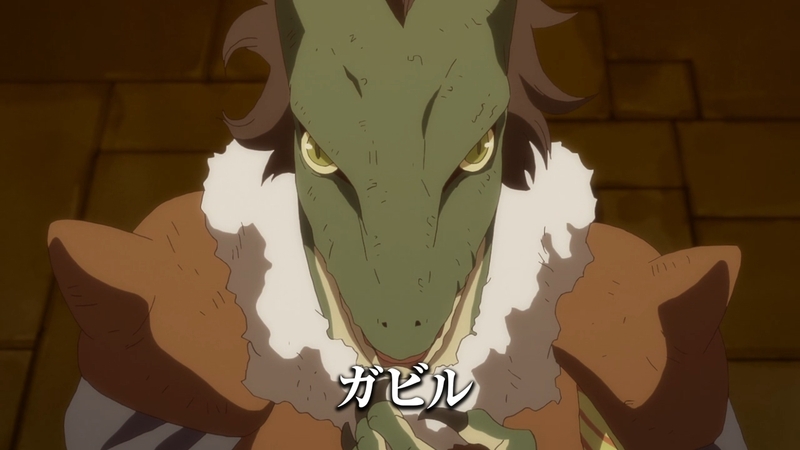 Just earlier, the lizard hero said he was named by a Lord Gelmud. Same guy. Same demon, actually. He’s just walking from village to village, trying to name all of the demihumans. I’m guessing that he wants to stir up conflict between all the races, but to what end? 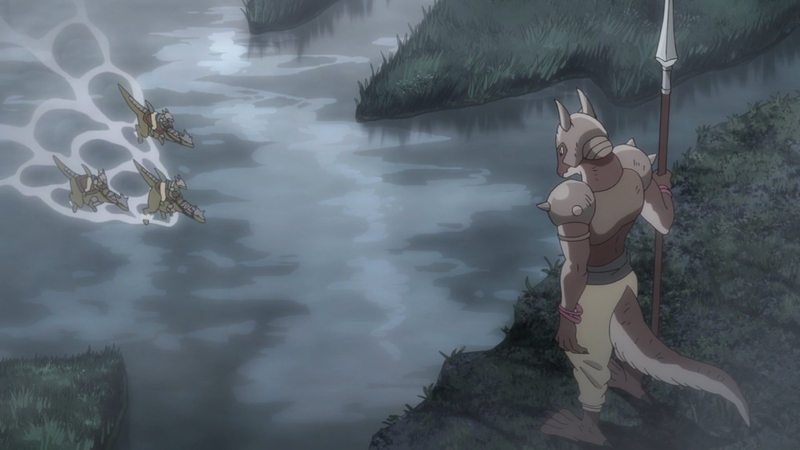 — Rimuru quickly hears that the lizardmen are trying to form an alliance with the goblins. We soon cut to Gabiru whining about how they shouldn’t fear the orcs. His followers think he should become the chieftain instead. I dunno, that hubris might be his downfall. But with that, the episode comes to an end. 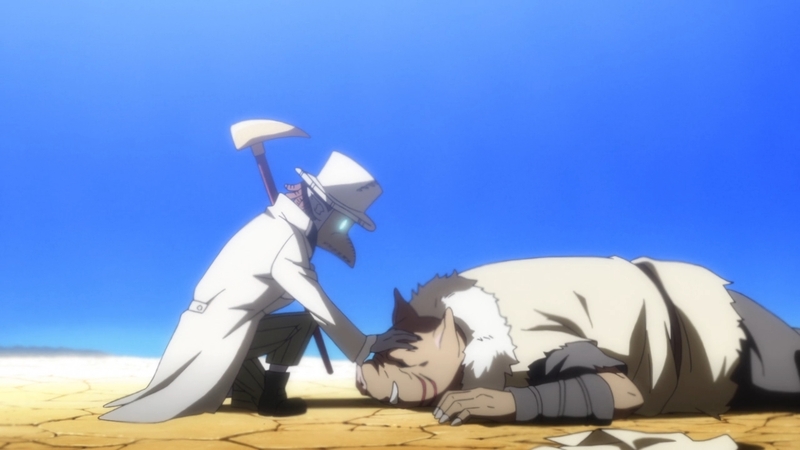 Just like the writer of Log Horizon is interested in economy, the writer of Slime is apparently a civil engineer. This is just him playing Civilization on a fantasy environment with one Slime building his empire, gradually. The detail of the names has its reason, not for being a videogame mechanic, but for being the symbol of the humanization of monsters. A very accurate detail when you think about how harmful it is to isolate and dehumanize a group of people or any thinking creature. It’s not worth it if you have to do mental gymnastics for a weak metaphor. “Oh hey, we have a society that has existed for decades. But oh yeah, we don’t use names.” That’s ridiculous. There are other ways to show humanization than a label. So I don’t buy it. It’s just a gameplay mechanic. 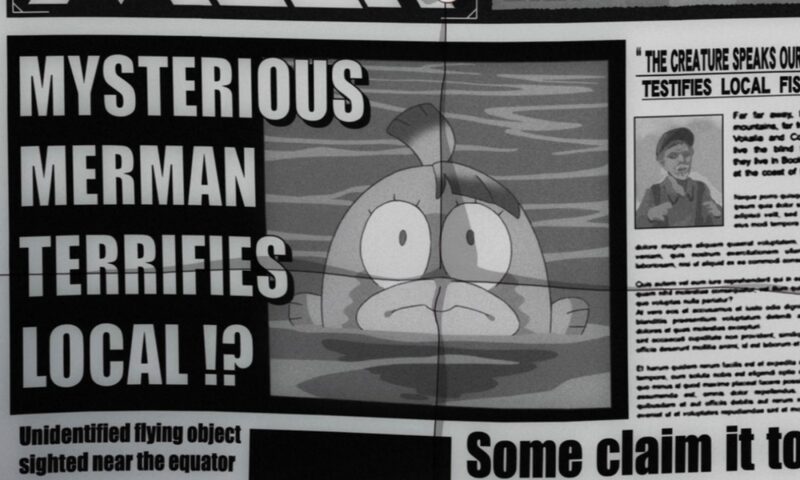 Generic mob named goblin in a JRPG? Not important. Named mob? Important. I think it is derived from RPG mechanics, actually – named monsters are usually more powerful than their unnamed counterparts. 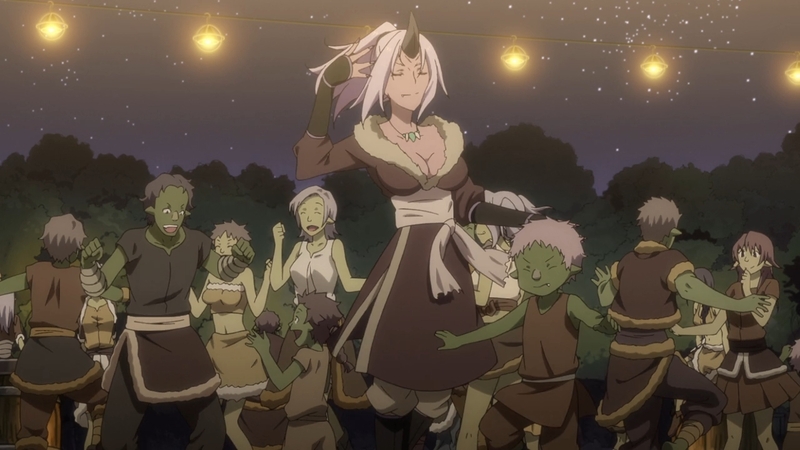 So Rimuru is basically turning the entire (friendly) population of the forest into boss mobs. I thought it was a pretty clever gimmick tbh… even if it doesn’t really make sense, practically speaking.